When embarking on outdoor adventures in the winter, the right pair of hiking boots will often make the difference between a great time and a miserable experience. It is therefore important for guys looking to enjoy time on the trails in cold weather to find the best men’s winter hiking boots. 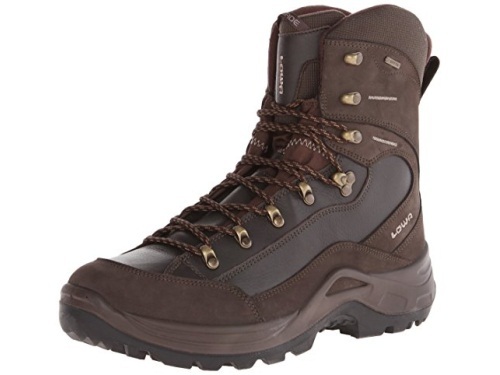 **Below, you'll find our detailed reviews, but you can also click the links above to quickly check the prices of our top 3 picks for men's winter hiking boots. Winter hiking boots are an important gear item. It is easy to think that the hiking boots you use in the other seasons are fine for winter hiking, though this is not the case. There are aspects of winter hiking boots that make hiking in treacherous conditions safer and more comfortable. When hiking in the winter it is very important that your feet don’t get wet. In cold weather conditions if your feet get wet it can quickly lead to painful blisters. Worse yet, your feet can freeze. This will not only hurt, but can lead to frostbite. Waterproof hiking boots that are warm will protect your feet from the elements. The surfaces that you are hiking on in the winter will not only be cold, but may be icy, slushy and snowy. Winter hiking boots will have the traction necessary to handle the elements and many have the capability to be used with snow shoes and crampons. When it comes to winter hiking boots there are many options available. There are boots that are ideal for an hour or two of hiking in the snow, those that can handle a weeklong backpacking trip through snow and ice, as well as mountaineering boots for the most treacherous of conditions. Options include single or double layer insulated boots that often have removable liners of different types, like felt or thinsulate. The outside of winter boots are made of various materials, to include leather, rubber and plastic. A waterproof membrane is necessary to create an impermeable barrier to keep water from finding its way into your boots. When purchasing a pair of kicks for the winter, you are looking for hiking boots for the snow, ice, and overall cold-weather. It is important to consider multiple factors in order to choose a pair that will meet your needs and keep you comfortable and safe while on the trails. What are your plans for these boots? Think about the types of winter hiking you will be doing with your new boots. Will you be hiking on a snowy trail below the tree line for an hour or so or be hiking for eight hours in low temperatures encountering slush, ice and snow, both below and above tree line? Do you plan on backpacking? When anticipating carrying heavy weights over long distances, winter backpacking boots may be the best choice. If you are looking to spend a lot of time in icy conditions, mountaineering boots should be considered. Are you anticipating hikes that will involve crampons and snow shoes? If that is at all a possibility, you will want to take a look at boots that are crampon compatible and that work with your snowshoes. Having a good understanding of the types of hiking you will be doing is important in order to choose the boots that will best meet your needs. Make sure that the boots are comfortable, just as you would when purchasing hiking boots for the other seasons. Part of that comfort includes warmth. Boots that keep your feet warm﻿ and comfortable will make it easier to get out and enjoy the outdoors during the colder months. Good support is a key element of comfort and this is just as important in winter hiking boots as in those you use during the warmer months. In addition, proper support will protect your feet and ankles from injury. When choosing a pair of good boots for winter hiking, pay attention to the midsole under your foot and the cuff that wraps around your ankle. Keep in mind that the higher the boot goes up your leg, the more support they are likely to have. Should you plan on long hikes with heavy packs, boots with stiff midsoles, heel and high ankle support are a good option. Shellback heel support, for example, provides a rigid platform for the utmost stability. The boots should fit properly, though this can seem confusing. You are looking for the boots to be snug all over but not tight anywhere. Make sure you are able to wriggle your toes when the boots are laced up; if you can’t than the boots are too snug. It is best to try on the boots with the socks that you would intend to wear when hiking in the winter. Should you intend to layer your socks, wear those layers when shopping for boots. The LOWA Men’s Renegade Ice GTX Hiking Boot is a solid leather upper with a synthetic sole that is handcrafted in Europe. A Partalena® fleece lining offers extra warmth while wearing these waterproof, breathable boots on the coldest of adventures. For winter hikes or snowshoe treks, the 8.25” shaft will keep your feet both stable and dry. With an outsole made of rubber and Tencel® that offers a specialized winter tread profile, these men’s winter boots by LOWA will provide you with the grip that you need when traversing snow and ice. While considered to be not as stiff as mountaineering boots, they have the support you need for long backpacking trips through tough conditions. With nearly 90 years of experience, LOWA has created insulated hiking boots for men that offer a classic look that will endure the roughest of elements. 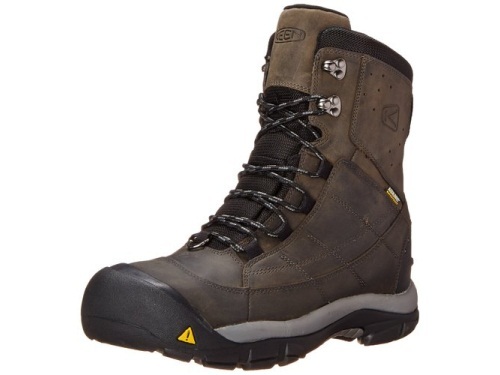 The Keen Men’s Summit County III Winter Boot is an attractive leather upper with a synthetic sole. Featuring a waterproof membrane and considered to be the warmest of Keen’s winter boots, they will keep your feet warm and dry on snowy day hikes and backpacking trips. With a protective toe cap and shellback heel support, as well as a shaft measuring about 8 inches from the arch, these men’s winter boots by Keen offer increased stability and protection while being relatively lightweight. The dual-climate weather outsole has the grip needed for the slick ground conditions you are likely to encounter when embarking on a winter hike. These insulated waterproof hiking boots by Keen will have you prepared for any winter conditions that you encounter on your adventure. 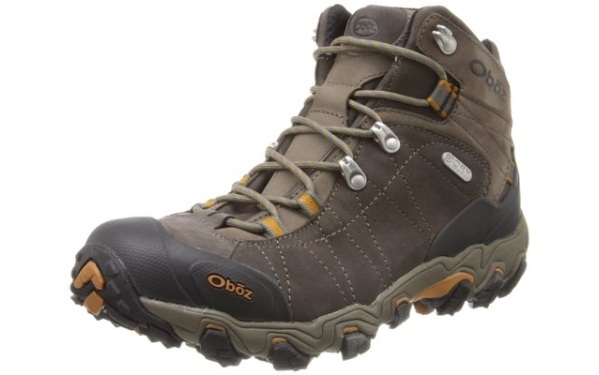 The Oboz Men’s Bridger BDRY Hiking Boot offers an attractive look along with a myriad of features. Boasting a BDry waterproof membrane that blocks water from getting in while wicking away sweat, these men’s winter boots by Oboz will keep your feet warm and dry no matter how wet the conditions you encounter. These versatile boots by Oboz are made of leather and include a sticky outsole with 4mm directional lugs that offers the traction you desire on rough terrain. A nylon stability shank provides excellent support so that you will be well-prepared for a variety of conditions. The BFit arch supporting EVA insole ensures that your feet will be comfortable during your explorations, while the TPU flex chassis will prevent you from developing bruises even when spending long hours on the trails. Oboz offers a boot that is ready to tackle a variety of winter adventures with the Men's Bridger BDRY Hiking Boot. Made of leather and fabric with a rubber sole, the Vasque Men’s Snowburban Ultradry Insulated Snow Boot offers a traditional look with modern warmth and comfort. This waterproof snow boot includes an UltraDry membrane that keeps the water from getting in so that your feet remain dry, while 400g 3M Thinsulate Ultra Insulation and a fleece-lined collar work to keep the cold out and your feet warm. These men’s winter boots by Vasque include a rubber toe cap, along with an EVA midsole and TPU shank (part of the supportive structure between insole and outsole) to deliver performance, stability and comfort. The Vasque Venture outsole provides the traction that is necessary when exploring the outdoors in winter conditions. In addition, these winter boots work well with snow shoes to further satisfy your thirst for exploring. With these boots, Vasque has met their goal to inspire folks to get outdoors and "embark on an adventure". 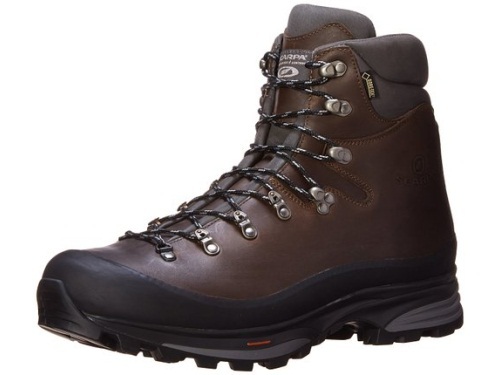 An attractive full-grain leather upper, the Asolo Men’s TPS 535 LTH V Evo Hiking Boot is a great option for backpacking in cold weather and winter conditions. These boots are lined with Cambrelle® to provide the warmth you need to keep trekking regardless of the temperature. Unique in these insulated hiking boots is the TPS technology present in the outsole, which includes three shock absorbers that are made for each area of the foot that receives the most significant impact when involved in activity. This is great for your feet and legs during long journeys and the molded rubber outsole is built for performance on all types of terrain. These backpacking boots by Asolo will keep you moving forward as you explore the outdoors during colder temperatures. 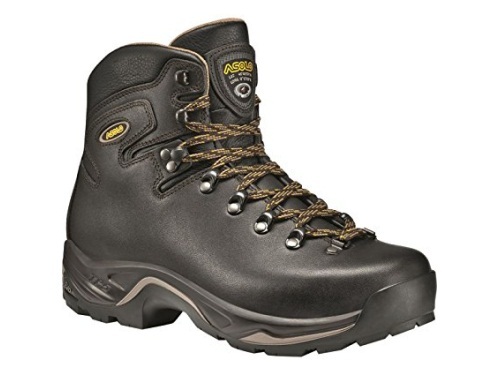 When considering the best cold weather hiking boots for males, take a look at the Scarpa Men’s Kinesis Pro GTX Boot. These attractive Nubuck leather uppers offer a durable all-terrain Vibram traction outsole that ensures you have the grip that you need. A waterproof Gore-Tex lining allows your feet to remain dry and comfortable throughout your adventures; these winter-ready boots are a good bet for long hikes or backpacking trips through rough terrain in tough weather conditions. These men’s winter boots by Scarpa offer a dual-density PU midsole, along with a cushioned collar and tongue, ensuring your feet are comfortable on the long treks that you love. Micro-pulley hardware lacing makes it easy to get out on the trails and keep moving. No matter the outdoor adventures, with these versatile boots you will well-prepared to handle all that you encounter. With experience creating boots since 1938, Scarpa offers an excellent hiking boot for all of your cold-weather adventures. 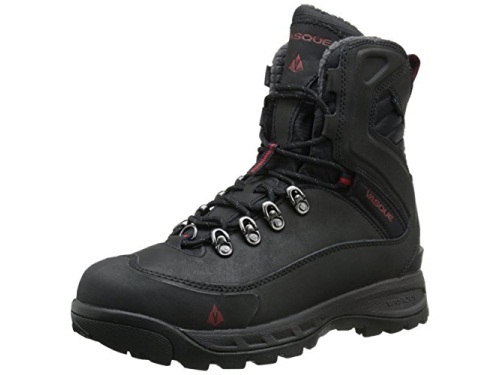 Our top choice is the Asolo Men's TPS 535 LTH V EVO Hiking Boot; like the other options, these boots will keep your feet warm, however they also offer a system of shock absorbers that will keep your feet feeling good during challenging journeys through difficult conditions. These hiking boots by Asolo have the traction that you want (and need) in a molded rubber outsole that will allow you to maintain your confidence while traversing an icy hillside. Owning a pair of these boots will help you be well-prepared for all that you encounter as you embark on future adventures.